22nd January 1561, York House, The Strand, London, England. Francis Bacon was the youngest son by second marriage of Queen Elizabeth First’s statesman Sir Nicholas Bacon. Trinity College, Cambridge at the age of twelve. Gray’s Inn, London to study law. 1582: Bacon became a barrister. 1584: He took up his seat in parliament in the House of Commons but his opposition to Queen Elizabeth the First’s taxation plans meant that he was not promoted. 1601: He became one of the Prosecutors of the Earl of Essex even though he had originally been one of his supporters. 1603: Bacon was knighted by the new King, King James the First. 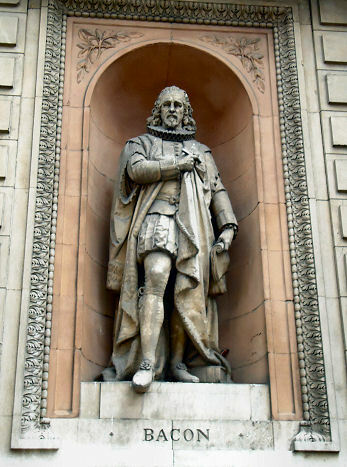 1618: Bacon became Lord Chancellor. 1621: Raised to the Peerage as Lord Verulam of Verulam and then created Viscount St Albans. He had been well known for accepting bribes at law and when he was accused of accepting a bribe from one of his current litigants, he admitted his guilt. He was stripped of all his public offices and went into retirement. Bacon’s philosophical writings, however, continued to be influential. In particular he is noted for his theory that the only knowledge of importance to man was that empirically rooted in nature. He formed the principles of inductive thinking which were a continuation of the work of Aristotle and which paved the way for modern scientific theories based on analysis of natural processes. 1597: “The Colours of Good and Evil”. 1605: “The Advancement of Learning”. 1625: “Slyva Sylvanum” (including New Atlantis). (1630): “Maxims of the Law”. “Elements of the Common Laws of England”. (1642): “Reading on the Statute of Uses”. 9th April 1626, London, England. Caught a chill after experimenting with the refrigeration of food by snow. St. Michael’s Church, St. Albans, Hertfordshire, England.